The SVD Zebra is a Sniper Rifle first introduced during the 05-23-11 Content Update. It is a variant of the Dragunov SVD. SVD stands for Snayperskaya Vintovka Dragunova, which translates to Dragunov's Sniper rifle. Therefore, having the word "dragunov" in front of "SVD" is redundant, as the meaning would then be Dragunov Dragunov's Sniper rifle. The Dragunov SVD houses high damage (for a semi), very high stability, acceptable accuracy and mobility but low range. The Dragunov is a very good choice for people who decide to use a semi-auto sniper rifle instead of a bolt-action, but comes with low range and other drawbacks experienced by semi's like less peripheral vision and lowered mobility (maybe not mobility) when scoped in. 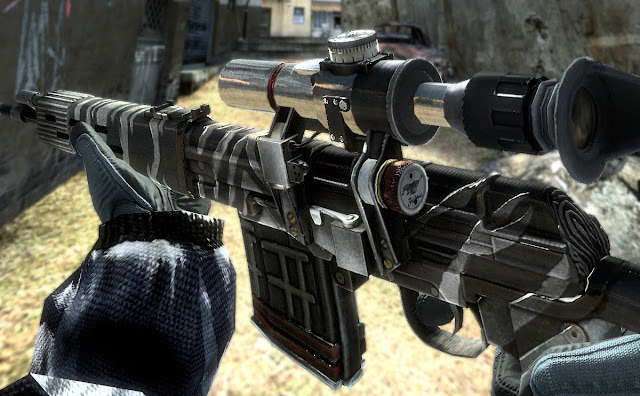 One of the biggest draws to the Dragunov is that it has arguably one of the best moveshots in the game with low recoil and a consistant 1 hit kill rate (within range), on top of its semi-auto nature. This is balanced by having a painfully low amount of ammo (10 in clip, 10 in reserve) and aformentioned low range. It should be noted that when zoomed once with the regular scope, recoil is substancially lower compared to when fully zoomed in. Edit: it has been confirmed scoping ing does not affect movement speed, although moving will affect accuracy evident in the inaccuracy meter on the right when scoped in. 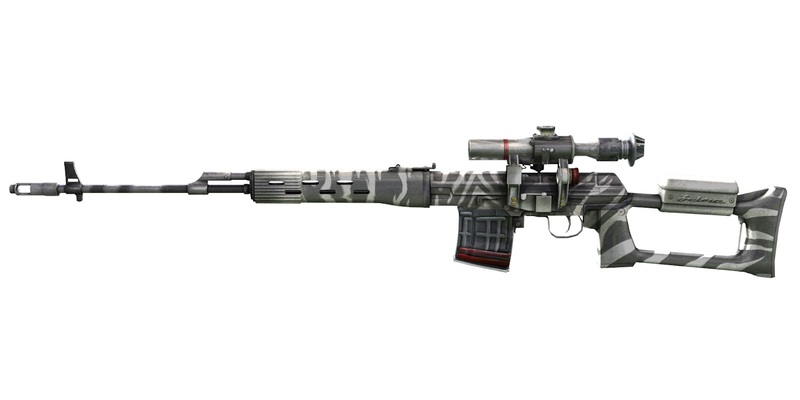 The Dragunov is unique in that its mods can greatly affect its playstyle, as it can either embrace its traditional sniper role with higher accuracy at the cost of mobility or become more rifle-like with an emphasis on stability and RoF. Either way, this weapon remains highly effective and easily one of the best cost/preformance ratios in the game.